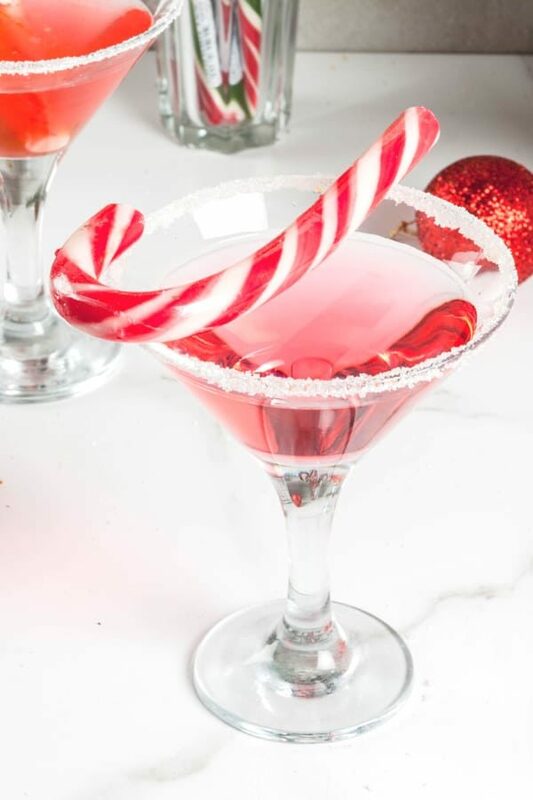 The Candy Cane Martini blends flavor of mint with a hint of berry and tops it all off with a candy cane. This is a beautiful drink that looks cheerful and fun and tastes the same way. The Candy Cane Martini blends vodka with creme de menthe and Chambord. It’s mostly peppermint, but with a strong hint of delicious raspberry. This is such an easy drink to make. The trickiest part is the rim. You crush a candy cane into tiny pieces and them rim your glass with it. But it’s easier than you might think. The sugar in the peppermint candy makes it cling to the glass rim easily. 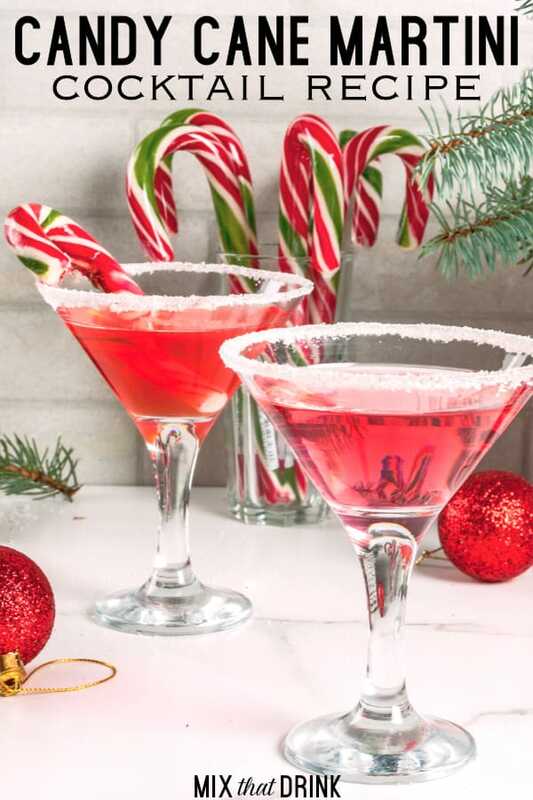 There are other versions of the Candy Cane Martini recipe. Most of them use grenadine rather than Chambord. Some add white creme de cacao or another clear chocolate liqueur. This version has a strong peppermint flavor. If it’s too much for you, then leave out the single drop of peppermint oil, which is very intense. The creme de menthe adds a sweet mint flavor, like mint candy. The oil adds a sharp, bracing, spicy layer of peppermint. It’s good both ways – it just depends what you like. The reason I use Chambord rather than grenadine is just personal taste. I like the flavor of it better, and how even though it’s sweet and fruity, it’s not cloying. And the reason I leave out chocolate liqueur is also personal preference. My recipe reminds me of candy canes I used to get as a kid, which had a hint of berry along with the mint. There was no hint of chocolate. Some recipes also add cream – usually half and half or whipping cream. This makes the drink creamy, which is divine, but also doesn’t taste like those candy canes I remember from childhood. But you should play around with the recipe and make it your own. Every variation on it is delicious! This is a great drink to make big batch style and serve at a holiday party. You can rim the glasses in advance, mix the drink together in a pitcher, and just pour as needed. And if the rim is more trouble than you want to go to, just place a mini candy cane in or on top of each glass as a garnish. This looks beautiful, and it’s much easier. You can also rim glasses with sugar, if you prefer. Or shavings of white chocolate. With a little simple syrup around the rim of your glass, chocolate shavings will stick wonderfully. However you choose to make this drink, it will be great. And it’s such an easy flavor to love that guests are almost guaranteed to love it. 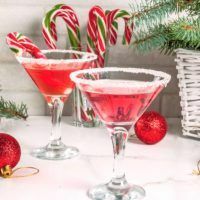 The Candy Cane Martini is a great drink the holidays or any other time. It blends the flavor of peppermint with a hint of raspberry. Fill a shaker with ice and pour in the vodka, creme de menthe and Chambord. Rim a cocktail glass by rubbing the simple syrup around the rim and then dipping it into crushed candy canes on a saucer. Pour the mixture from the shaker into the glass and garnish with a candy cane. Hi. Is the simple syrup just used to line the rim? Thanks! Yes, it’s just for the rim, and I’ve rewritten the instructions to make it clearer. Of course, if you’d prefer the drink was sweeter, you can always add in a little simple syrup.